Drive through western North Dakota and you’ll drive on much better highways than a few years ago. You’ll also come across more darned good coffee shops and eateries. I live in rural Western North Dakota. So, to get anywhere, well, it requires some time. I love to drive along and notice things. Recently my husband and I went on a small road trip to Dickinson and back. This time I was the passenger and really got to take a good look around, notice things and think. What I noticed on this trip was the hardworking people of the oil patch. Western North Dakota is home to a diverse group of people; they’re here because of oil. When we first came, in October of 2011, there were literally people here from all over the world. One of our favorite things to do was drive along the street and count all the pickup license plates of all the different states. We were also fascinated by the number of pickups and semi trucks driving down the highway. In a string of traffic, 10 out of 20 were semi’s hauling something to do with oil. The next 8 would be pickups and in the summer, the other 2 might be a car or motorcycle. Traffic was so heavy that the pavement had huge grooves in the drive lanes. The truck bypass through Watford City was so bad that one had to run their tires from the top of one groove to the other for fear of losing control and dipping into the other lane. Highway 85 went right through both Watford City and Alexander. Fortunately, Watford City had some control with traffic lights. However, in Alexander, the traffic was so heavy that simply crossing the street was a 15-minute wait. To make a left turn into traffic was for sure a 15-minute-wait for the person in a pickup or car. It was even worse for the semi truck, especially fully loaded. It was almost always a 30-minute-wait. Unbelievable! During the lull in 2014-2016, bypasses were built to accommodate the additional traffic. A welcome relief compared to the congestion of the first years of the recent boom. During the lull of the boom, activity slowed. People left but the county continued to build its infrastructure. Now we have a bypass that misses both Watford City and Alexander. Highway 85 is now a four-lane highway. So, the strings of traffic are different now, it isn’t as threatening as it used to be for the average driver. One has the luxury of waiting only a few minutes to jump out in traffic. A trucker still has an even longer wait. The busy hustle bustle isn’t quite as noticeable because we are better able to absorb the traffic. We have more restaurants, more hotels, more gas stations, and more housing. This is not the first boom that has taken place in this area, the first was in the ’50s, then the 80’s. Many factors led up to this boom. Those include the new technology of fracturing and horizontal drilling. They opened up new possibilities for more oil to be drilled. West of Watford City, a concentration of oil activity — an oil drill and storage tanks all in one location reduces the footprint of the work of oil drilling. The United States was in dire straight’s economically. People were struggling financially. Also well let me just say it, this country can be very unforgiving and harsh, so in order to get people up here to work, the pay was excellent. That explained why all the license plates from all over the United States were here. In all the hustle and bustle we often commented on the “air” or the “feeling” here. People were excited, happy, hopeful, expectant, they were able to take care of their family. Their financial frustration was changing! Even the men that came alone and sent their checks home to their family, had very tired but excited looks on their faces. It was a fresh awesome exciting feeling, so nice to be a part of “history in the making”. For thousands of truck drivers, when their day comes to an end, they park their rig, climb in the sleeper berth to wait for their next allowable driving shift. Life for the oil man can be very lonely and grueling. Most often they work two weeks straight that consist of 12 -15 or more hr days with no time off. Then, they’d go home for a week, then back up they come and do it all over again. Many left their wives and children back home and were able to go home only a few times in the year. School breaks would be a chance the family could come and visit dad for a week or two. For us, we came together but we lived in a fifth-wheel trailer for the first year and a half. It was worth it so we didn’t have to be separated from each other. I always considered myself one of the lucky ones, to get to come along. A lonely night on a dark and snowy road for truck drivers. Now after living here and being oil man’s wife, when I’m out in the country driving, I find it just fascinating to see pump jacks pumping up and down in a consistent rhythm and wow, how far back some of these are off the highway. Realizing that a truck has to get in there — it can be challenging. How does he do it on these narrow roads? Knowing that in the winter it is complete ice, or how thick and slimy and slick the mud can be. I just cringe when I realize there is no cell service way in the backcountry. When I see where that well is, I think about my men, I wonder how many close calls have they had and just never tell me about them. Then I wonder if I would want to know or just better off not knowing about it? Or when I see a new well site going up, I look at all the trailers parked and see all the lights around the new well. I know that this place is going to be the place of action for a few weeks, and I think about all the work it is providing an income for so many people. Oil is such a controversial subject, there are so many pros and cons. There is nothing more organic than oil. For my family, it has been great. I believe many others can say the same thing. It has been difficult, and understandably so, for the local people to see so many things change. Unfortunately, as with anything, there seems to be that “group of people” that mess it up for those that are doing their best. But when I think about all that work that this oil provides for so many people, it is just mind-boggling. From the geologist to the workers at McDonald’s, to the factory that builds these massive pieces of equipment, clear to me wearing my cosmetics, oil is awesome! I will never forget the first time we came to North Dakota and drove around with my husband’s prospective employer, the awe that we had. Getting up really early in the morning created a memory of hearing the semi’s already out on the highway. It represented the love, adoration, pride, and hopefulness not just for me, but for the other people as well. I can honestly say, I loved them all! Watford City Main Street, JL Beers, and McKenzie County Farmer replaced the original buildings. Today, seven years later, I still have that same sense of pride, love, and adoration as I look at these long lines of traffic, of these men and women out in their work trucks, semi’s, and whatever else they might need to get them down the road. Or when I drive by the huge apartment complexes and really just don’t seem to notice all the pick up’s parked in the parking lots, it’s just normal now. This spring will bring more people in, change is coming again, some will struggle with that, others will embrace it. I will probably do a little of both, but I think I will always hold these hardworking people in high regard, as they roll on down the road. Early morning, just after sunrise — the men and women of the oil patch are already putting in their hours and their miles in their trucks. Sandy contributes her insights from the North Dakota Badlands. She’s an artistic and articulate person who is available to speak to your group. Go to her website to see more of her creative work. I’m a wife, mother, grammy, daughter, sister & friend. I live on a small Hobby Farm of Heritage Breed Animals or animals with a special story, (I had to, or this would be a national zoo) in Western North Dakota. I love my Lord Jesus Christ, my family, my friends and I have been blessed with the best job in the world! I love to take pictures and write about them. The goal with that is to put a smile on someone’s face and take them with me on a sweet journey, if only for a brief minute. Coming up this week: a glimpse of an easy hiking trail with spectacular views — Boicourt Trail. Be the first to know. We’ll send to you a note when a new article is published. Just tell us where to send it. 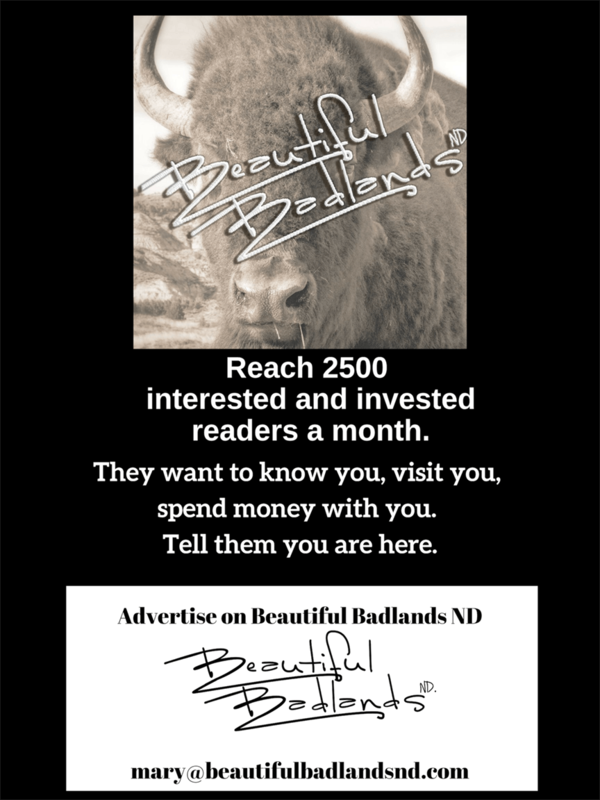 The “subscribe” box above will get those instant notes –AND– the free twice-a-month Beautiful Badlands ND newsletter. For even more from the Badlands, follow us on Facebook where you’ll find resources, videos, and articles from many sources.